This Four Seasons is one of those Four Seasons that I like but not head over heel for. I do think it is difficult to operate an urban Four Seasons as the number of rooms tend to be higher and traffic is more mixed in terms of none staying guests going in and out of the hotel. With that said, the only other luxury alternative is Faena Hotel and that hotel has its own deficit as well....so the choices is limited. The location of this Four Seasons is very good. It's at an area called Recoleta which is one of the best neighborhood in Buenos Aires. The hotel is actually at the end of a very wide boulevard called Ave 9 de Julio. In fact, it is the widest boulevard in the world. The boulevard more or less ends next to the hotel and becomes a freeway. Typically it wouldn't necessarily be a good thing to stay at a hotel next to the entrance to a freeway. But in this case, somehow it didn't feel like a negative. In fact, it might be a plus if you are looking to get in and out of the city quickly. 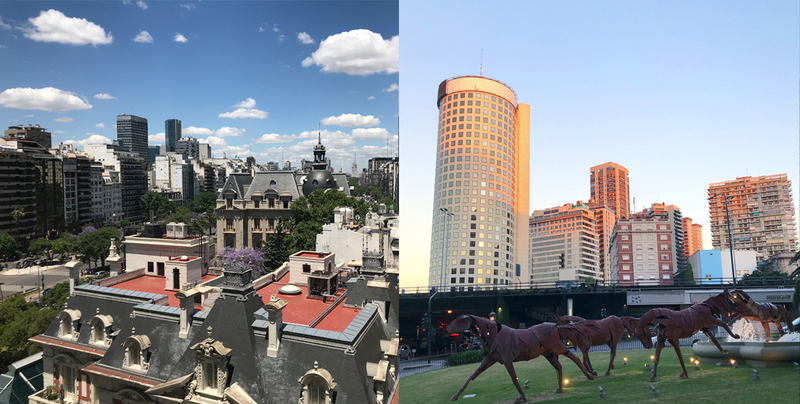 The Museo Nacional de bellas Artes is within walking distance from the hotel as well as the fame cemeterio de le Recoleta where Eva Peron is burried. There are few other museums I didn't get to go such as Museo Nacional de Arte Decorativo in the area. Next time. I can't say I particularly like the lobby at this Four Seasons. Most Four Seasons go with clean line stately look with lots and lots of beautifully arranged flowers. This one has an Eastern European fashionable look which is not my cup of tea. It doesn't mean the lobby is ugly but just not my taste. The Belle Epoque-style mansion on the back of the hotel is quite nice. The mansion is connect with the hotel via a podium. The podium level of the mansion serves as event space. I did a walk through of the space and wish the lobby of the hotel is in the mansion. The look is much more gracious to me and in keeping of typical Four Seasons style. I stayed at the Mansion-view one bedroom suite. Above this would be rooms in the mansion which has rooms decorated in traditional style which I didn't want for my stay at Buenos Aires. The owners suite looks quite nice but it's close to three times as much as the mansion-view one bedroom suite and it's only 200 sqft bigger. It does seem to have a fabulous view though. I was plenty happy with the one bedroom suite I had. I love that they have two separate bathrooms. It's always a plus in my book. The finishes in the living room and bedroom is nice. The bathroom looks new and water pressure is good. The closet was a bit on the smaller side. It was a walk-in closet but it's a one person walk-in closet so that should give you a good idea of the size. I had dinner at the Elena restaurant. I really enjoyed it. I thought the decor was on point. I love the black and white marble tiles. I can just imagine people doing tango on top of it! It just feels very Argentinean. I had a steak which was perfectly cooked. Tip: Remember in Argentina, medium rare means medium well. If you want medium rare, order rare. There are lots of local Argentinean in the restaurant which is a great sign. You know locals can go anywhere and they decided to patronize Elena so you know it's good. Indeed, it's one of the top three meal we had in Buenos Aires. The hotel concierge is fabulous and they arranged for me to go to Colonial in Uruguay, an estancia in Pampas region, and a tango dinner at Faena Hotel. I would highly recommend the tango dinner. The food, as can be expected, was just ok. The dancers and choreography were out of this world. It was so good. I feel like I should take up tango for cardio exercise! I didn't get to visit the hotel rooms at Faena hotel. The decor of the public area of Faena I do like. It's modern but in a French not Eastern European way if you know what I mean. However, this hotel has two drawbacks for me: the room decor feels borderline tacky from pictures online and the hotel is in the Puerto Madero area which isn't exactly close to tourist attractions. Hence I was happy I had chosen Four Seasons over Faena. When I go back to Buenos Aires, I would definitely stay at Four Seasons again. This place is at a great location. It has delectable food at its signature restaurant. The service standard is good although it can be better. I do wonder since I am in South America not Asia, the service here is probably as good as it gets. And what score would Bruno Tonioli have given to this Four Seasons? I say a solid 8.